Thousands flock the streets of Central London to wave goodbye to 2012 and welcome 2013. Mayor of London Boris Johnson said: "What an amazing end to an incredible year". About 12,500 fireworks were set off with accompanying music. 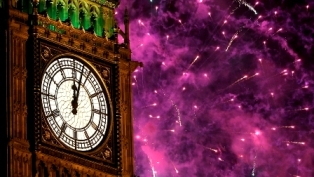 New Year's Eve Fireworks Displays were organised all around the world - New York, Melbourne, Auckland, Shanghai all had theirs, but we think London was the best! See for yourself!